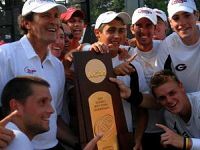 The following articles are relevant to the Georgia men's team. The United States captured its eighth title in 10 years at the Master'U BNP Paribas International Collegiate Team Competition last weekend. Florida's Oliver Crawford and Pepperdine's Ashley Leahy each won three singles matches in three days to help the Americans.